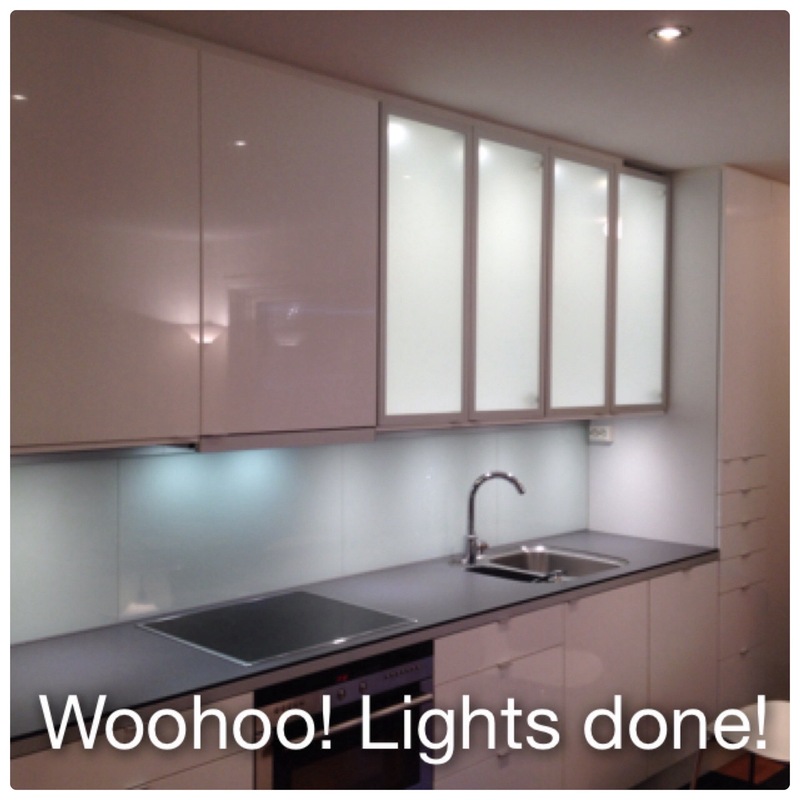 OK – we are still working on the lights, countertop light this time. You know, the one’s that are mounted under the upper cabinets! I have 5 of those. First day with lights was a bit fiddly because I didn’t have a lot of space to work with. This job, plenty of space, but more work. 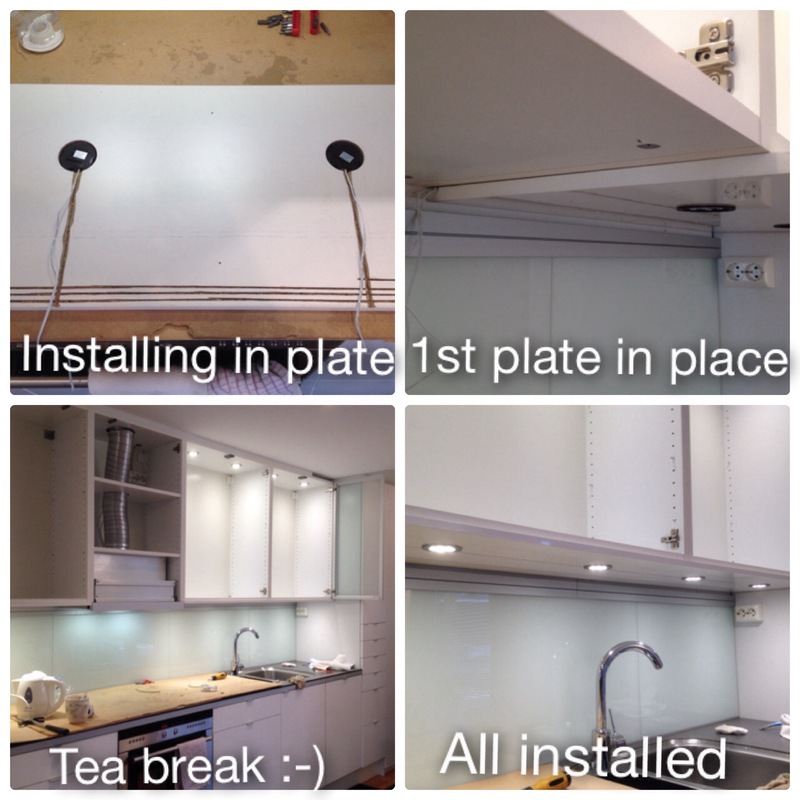 When we installed the kitchen originally, we used some cover panels underneath the cabinets, to make everything look nice. It also gave us the opportunity to hide the wires for the under cabinet lighting. This time around I decided to recess the new lights into the cover plates. I figured it would be a much nicer look, than putting them on the outside, like the old one was. Since these lights have their own wiring system, we needed to get a little creative for how to hide the wires. and we decided to make an individual “groove” in the panels for each wire. Off course I completely forgot to take a photo during this process? Even though you can see what I’m talking about, on the first photo, on the second photo collage. Pulling down the cover plates with the old lights, was easy enough, just unscrew, cut the wires and the panels was off. 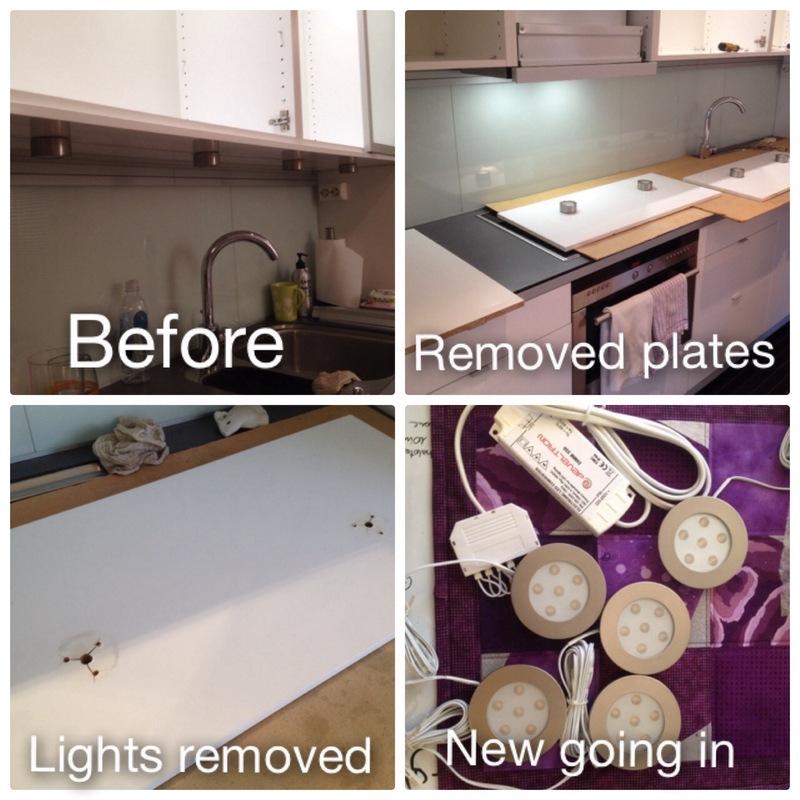 Removing the old lights, easy peasy! Installing new ones? Not quite so much, but I guess that’s always what happens. It’s easy to tear down, not so easy to “build up”. Back home again, I have to admit, it almost took longer to get the tools out, than to drill the 5 holes for the lamps. We attacked the third plate, got the wires in place, pulled nicely at them to straighten as we “feed” the third plate closer and closer to the second. Screwed it all in place…. and is was crocked at the back, a wire had caught! Down again and start over! Second time around we had it down to a fine art, and within 20 minutes it was done. Connected all the wires to the transformer, turned it on. Woohoo, it works! Well done! Love the end result. Your hard work paid off the new lights look lovely and great choice to go with LED. I am changing out all the fixtures in my new home with LEDs too.